A variety of colors!!! Yellow, Green, Brown, Orange, Blue & Light Purple. Knob measures 1-1/4" diameter x 3/4" high. Skirt measures 1-1/2" diameter. White inlayed painted pointer line. 1/4" bore, brass insert. Bore goes all the way through. Top side measures 5/16" diameter. 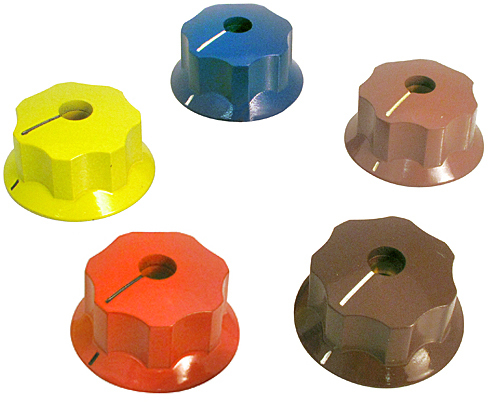 Ohmite phenolic knob. Green. 1-1/2"D skirt. 1-1/4"D knob. 0.75" high. White inlaid painted pointer. 1/4" bore, brass insert. 0.182"D center pilot hole. One set screw. Ohmite phenolic knob. Brown. 1-1/2"D skirt. 1-1/4"D knob. 0.75" high. White inlaid painted pointer. 1/4" bore, brass insert. 0.185"D center pilot hole. One set screw. Black plastic knob, purple inset on top. White plastic pointer. 2 set screws. 1-1/4"D x 3/4"H body. Fluted sides. 1/4" bore, aluminum insert, 1/2" deep. Black plastic knob, blue inset on top. White plastic pointer. 2 set screws. 1-1/4"D x 3/4"H body. Fluted sides. 1/4" bore, aluminum insert, 1/2" deep. New in packages. Black plastic knob, yellow inset on top. White plastic pointer. 2 set screws. 1-1/4"D x 3/4"H body. Fluted sides. 1/4" bore, aluminum insert, 1/2" deep. Black plastic knob, white inset on top. White plastic pointer. 2 set screws. 1-1/4"D x 3/4"H body. Fluted sides. 1/4" bore, aluminum insert, 1/2" deep.